Chaotically intermittent and heavily subsidised wind and solar have sent power prices soaring in Australia. 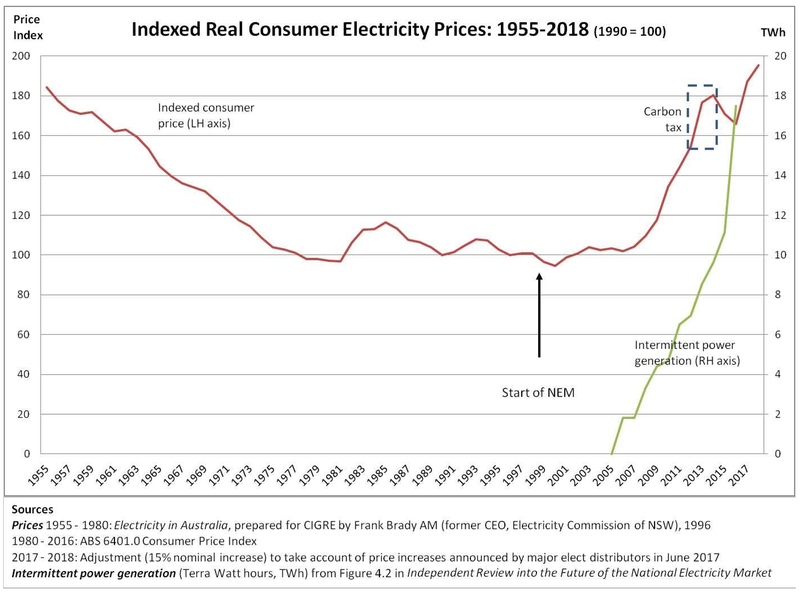 Barely a generation ago, Australians enjoyed the lowest power prices in the world, now they suffer the highest. And it took a little over a decade – see above. In a helpful exposition of Australia’s self-inflicted power pricing and supply calamity, Alan Moran details the causes and consequences below. Alan was prescient in his forecast of summertime blackouts – his article was published just a few days before 29,000 South Australian households and 200,000 Victorian households (not to mention dozens of energy hungry businesses) were unceremoniously dumped from the grid during a hot spell, which coincided with dramatic collapses in wind power output in both states. 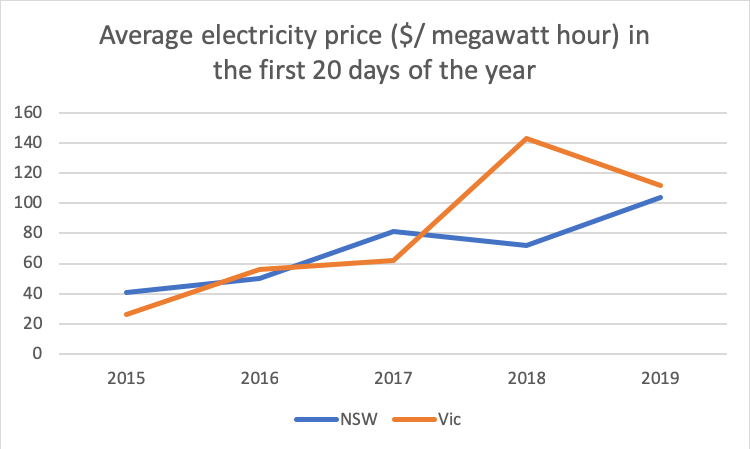 In the salad days prior to 2015, before governments’ destructive interventions undermined Australia’s stable low-cost electricity supply, electricity as a topic of general interest hardly figured. Any concerns about power blackouts just did not reach the front pages or the late-night news bulletins. At that time the National Market had about 50,000 megawatts (MW) of capacity, about 80 per cent of which was coal with gas and hydro providing the balance; with the exception of wind/solar, which had already grown to around 1,000 MW, all the capacity was under human control or “despatchable”. The National Market now has about 45,000 MW of dispatchable capacity plus nearly 7,000 MW of wind and solar, with a further 45,000 MW of wind and solar planned. No wind or solar facility would have been commercial without the subsidies they receive. From the outset of the National Market, 20 years ago, there has always been a bit of a stand-off between generators and retailers over summer supplies and their prices. The most marginal generators (usually gas) sought better rewards for remaining on-line as a contingency supply source. The market manager, now called the Australian Energy Market Operator (AEMO), being more risk averse than the retailers, would usually step in acting as a reserve trader, to guarantee extra supplies. This Reliability and Emergency Reserve Trader (RERT) now contracts for about 1000 megawatts, on top of which are “demand response” contracts with major users. In addition, the market manager has powers, which it increasingly uses, to direct generators to stay on line or to make themselves available when such actions would be unprofitable. In the last quarter this included forcing South Australian gas plants to be available 40 per cent of the time (with consumers providing special payments) to compensate for wind supply inadequacies. There is also an array of forums, readiness briefings and working groups designed to avoid blackouts and shortage-induced extreme prices. It is the increase in unreliable wind and solar that has driven this vastly increased central managerial control. But renewable energy’s most detrimental effect has been forcing unsubsidised coal generation from the market. It remains an open question whether the increasing wind supply will be responsible for power failures this year. One thing certain is that the price of electricity will rise as a result of wind/solar displacing coal. The annual effect is readily seen by examining the first 20 days wholesale prices over the past five years. Here is the picture for NSW and Victoria. Ironically, we see sequential government reports informing us that wind is the cheapest source of new energy supply. The latest one from CSIRO, an agency bloated with excessive funding, is incurious about why, in view of this competitive advantage, wind needs continued subsidies. The Commonwealth in an attempt to redress some of the damage caused by renewable energy subsidies has called for new proposals for dispatchable plant. As reported in The Australian, Trevor St Baker’s ERM power has combined with Chinese capital in proposing new coal generators in Victoria and NSW. In accordance with advice from the ACCC, the Commonwealth would be underwriting some of the risk. This means the government would be providing countervailing support to its regulatory subsidies for wind and solar, which created the market distortions price escalations in the first instance. An alternative approach would be eliminating all subsidies immediately. The opposition to this solution is formidable. It includes a majority of politicians spooked by an apparent wish of voters to get rid of coal and replace it with renewables, inaccurately depicted as taking advantage of freely available wind and sun. And it faces entrenched financial interests from those benefitting from the on-going renewable subsidies. The beneficiaries of such regulatory theft bankroll activists like Getup! and, like Macquarie Group chief executive Shemara Wikramanayake, will join other bankers lobbying to defend their subsidy-dependent investments and do so while pretending to virtue-signal. If those seeking the continuation of subsidies prevail, Australian electricity prices will remain among the highest in the world. 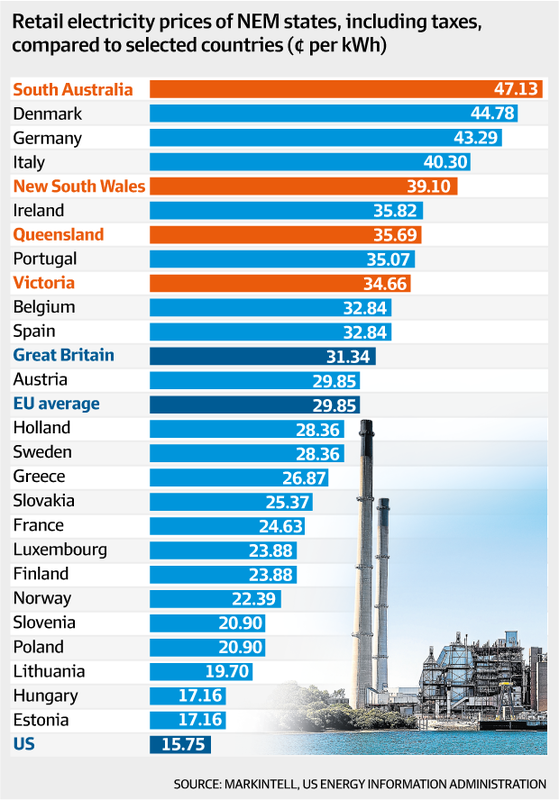 If such measures can be unravelled Australia will once again see the world’s lowest electricity prices with all this entails in terms of national prosperity.